Stylish designer multi-color Choli / Saree Blouse. 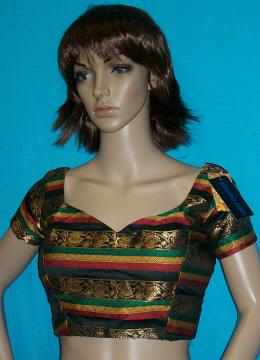 This designer readymade blouse has deep back neckline and has short sleeve. All sizes are differ from 1/2 1 inch. Buy Multicolor Readymade Designer Blouse / Choli (M / L), sold & shipped by Shieno Boutique where you can shop online for Latest Sarees, Salwar Kameez, Shawls, Jewelry & Clutches. This Sarees collection has been tagged as designer blouse for saree, stitched choli for lehenga ghagra, belly dance costume, womens top, indian clothing.